Let the games begin with this Ping Pong Set Floor Display. 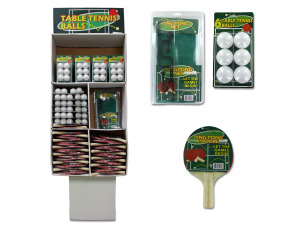 The 134-piece display has everything needed for the outrageously fun game of ping pong. Select from table tennis balls, paddles and nets so play can begin anywhere. Great for all ages. Set includes 10 mesh ping pong nets with brackets, 60 ping pong paddles made of wood and foam material and 64 plastic ping pong balls. Pieces are packaged in hanging clam shells and blister packs. Net package measures approximately 11.5" x 7.5" x 0.5"; paddle package measures approximately 10.5" x 6.75" x 0.5" and ball package measures approximately 7.5" x 4" x 1.75". — — — — 134 pcs.